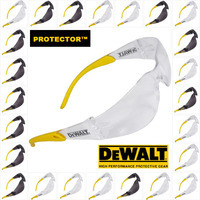 DeWALT is a company that is known best for their power tools, but they also make quality safety glasses. Founded in 1924, the company grew rapidly, and today, it’s known for a wide range of saws, tools and accessories. It’s no secret that DeWALT safety glasses aren’t the most stylish glasses on the market, but the lack of style is compensated by unmatched quality. 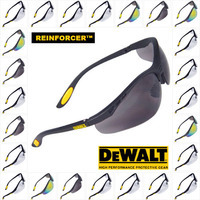 We carry several different types of DeWALT safety glasses, and many of these products are made for general contractors. 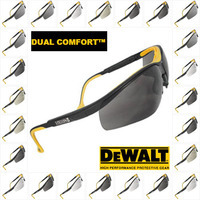 A large number of the DeWALT products that we carry have clear lenses, so they’re great for general applications. 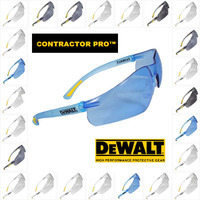 Our contractor pro and high-performance DeWALT glasses are quite popular. 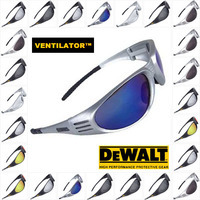 Although many of the DeWALT glasses that we carry have clear lenses, we also carry models that have light blue, smoke, silver mirror and indoor outdoor lenses. A few of our products are much more stylish than the rest and feature fire mirror or yellow mirror lenses.